Extremely attractive vintage framed Fine Art print depicting the America's Cup Race of 1885 between the American yacht The Puritan and the British entrant The Genesta. This was in the early days when the sporting rivalry between the two blue blood clubs New York Yacht Club and the Royal Thames Yacht Club were at their height. A gloriously romantic period of magnificent sailing yachts that stands in sharp contrast to the branded corporate trimarans of today. Amazing how these beautiful yachts sport the "modern" plumb bow so prevalent in today's racing technology.This wonderful fine print captures the action and incorporates a beautiful depiction of the race with a nice written history memorializing the event. There is a depiction of the 'Auld Mug' in the bottom right hand corner and the print is pencil signed by the artist, Franklyn Fairchild. The caption on the top reads "copyright in Great Britain, all rights reserved". There is a copyright on the art itself, � M&B which stands for Morris and Bendien Inc., a printer/publisher out of NYC. We've seen a few of these out in the market but I must say none as attractively framed as these. Very salty vintage frames in black paint with gold pin stripe that really fit the print nicely. They have a classic appearance that would be striking in almost any setting and perfect for a proper library, den, tavern, or mantle. They are matted and have non-glare mat glass. UV protection unknown. We believe the print to be lithograph but leave a little room for error as we've also seen it presented as an engraving. It is definitely not a process print and there are no tonal dots evident. The printing is extremely fine. 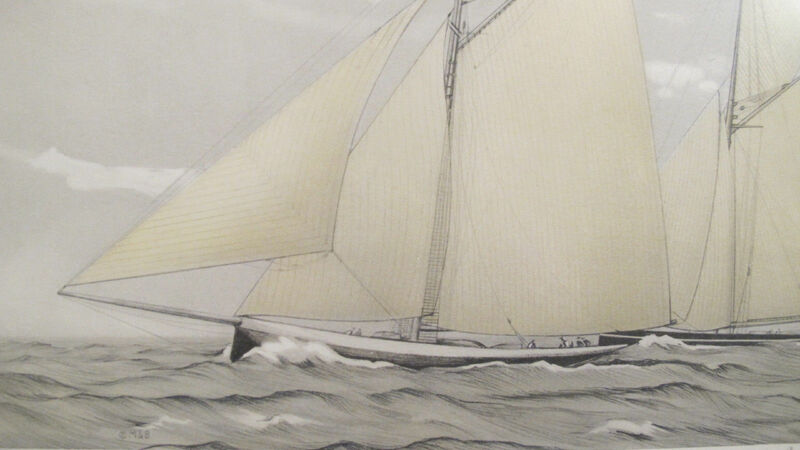 The Mystic Seaport Museum lists these as lithographs circa 1930's. This particular piece was gifted in 1955 as evidenced by the inscription on the back (see pictures) and the framing could have been done at that time or perhaps earlier. inside edge of the mat: 16.35"x14.35", and the outside frame: 22"x19". The print is de-bossed which adds further striking detail to this remarkable piece of yachting history. We do not have much history on Mr. Fairchild himself and if anyone has a history we would be glad to note it here. Flaws: The prints themselves are excellent with maybe slight tonal discoloration in the 'white' areas, the mats have slight discoloration and may not be archival. The frames have some "patina", some minor wear, nicks, denting, etc. as represented in the photos. We feel these minor imperfections don't detract and lend character to an overall impressive presentation. Please view our sister print by the same artist depicting the 1930 race: Enterprise (a Herreshoff build) vs. Shamrock V framed in the same format. They make an incredible pair.